This week, our good friend Scott Tiemeyer passed away suddenly. Noelle has known him since high school when he was her best friend's boyfriend and when they all worked at her first job at West Oaks Cineplex Odeon 6. Rob got to meet him just over two years ago, when Noelle and Kristen reconnected. 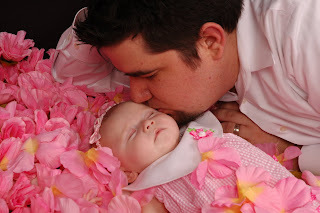 Scott and Kristen's eighteen year romance gave them a million happy memories and one beautiful daughter, Kingsley. Two years ago, Scott and Kristen had guests to Kingsley's first birthday parties write letters for Kingsley to read when she turned eighteen. This, to me, says so much about how loving of parents the Tiemeyers are. They were not just focused on the little milestones along the way - they were preparing to be wonderful parents seventeen years from that day. 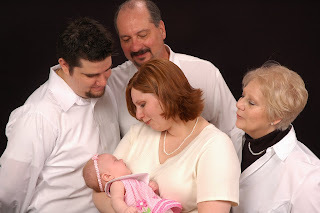 They wanted to ensure their daughter got good, honest advice and love throughout her life. It was and is inspiring. 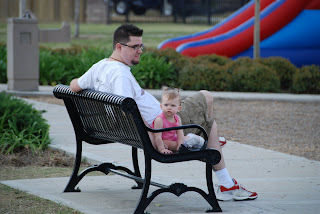 One and a half years ago, we played in the park with the Tiemeyers and Scott lamented turning thirty. He told me, "I just don't feel like I should be thirty." I pointed out that having a wife, a daughter, a house in Katy, and a job pretty much defines being thirty. He listened and smiled, but he still probably dreaded turning thirty. He was very much young at heart, always seeking out adventures and and new experiences, and I think the idea of slowing down and settling into his thirties didn't work for him. He still passionately followed the punk bands he loved, not only going to their shows and collecting their albums, but actually keeping in touch with them. He recently told me how he wen to see one of his favorite old bands, and he and the other "can't-believe-we're-thirty" fans were in a nostalgic, gentle mosh-pit. Someone managed to lose their keys or a contact lens or something, and the entire mosh pit stopped and used their cell phone lights to search the club floor. He laughed about how polite and mature they all were, though they were still punk fans bouncing off each other. And even more recently, he went to see the Misfits at House of Blues, and he got to go on stage and sing with them. With the wireless microphone in his hand, he looked out at the crowd and thought two things - "they should get to sing, too" and "when will I get this chance again?" He stage-dove into the crowd, who held him above their heads and sang along. He was sore for weeks, remembering that he was now an older man, but his heart seemed forever young. It was and is inspiring. 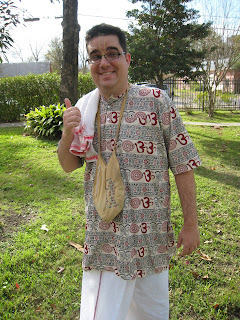 One and a half years ago, Scott and Kristen invited us to see Scott's initiation ceremony at the Hare Krishna temple here in Houston. Scott was beaming throughout the ceremony, and though it was very foreign to us, we got a chance to see how Scott gained so much peace and enlightenment from his guru and his friends at the temple. Scott had sought this experience and enlightenment out since he was a teenager, and he traveled to the temple many times a week to learn and pray. This devotion to his religion, this prioritizing of peace? Inspiring. The past years have had lots of little outings with the Tiemeyers - birthdays, pumpkin patches, meals, picnics, etc. - and they became some of our best "couple friends". No matter how often we hung out, there was always the discussion afterward of how we don't see them enough. They're funny, friendly, caring, quirky, and genuine. And what makes that so inspiring is the absolute tragedy they have lived through. Scott was severely injured three years ago in a car-jacking, and the lasting effects plagued him with horrible pain and complications. Medications led to more problems, surgeries filled all with worries, and the stress they had to face is just unimaginable. But they never lost their faith or their optimism. Inspiring. Two weeks ago, we gathered for a quick meal at Tony's. Scott and I planned how to uncover what kind of illegal operation might be going on in the suspicious Gift Xchange shop next door, when we weren't discussing his stage dive or our plans to have our kids marry each other. On the way out, as I lugged Jackson along in his car seat, Scott told me I needed some Tony's calendars and stuck two calendar magnets in my back pocket. We made our typical post-Tiemeyer conversation on the way home, saying we don't get to see them enough. Tuesday, I washed the jeans I had worn that day. The calendars were still in the back pocket, and the paper calendars dissolved into little pieces of paper to plague my load of laundry. I began to plot my revenge on Scott. And then he was gone. And all the outings we would have put on that calendar, all the ways he would have inspired us then, they seemed dissolved too, gone. Kristen and Kingsley are weathering this horrible storm, and we and a million other devoted Tiemeyer fans will ensure they do not face it alone. Noelle has been her usual amazing self finding ways to help and show our love. Jackson has been helping by being his cute, happy self and cheering up people. I got to do my part today. But after I left the podium, more volunteers started standing up, and more stories were told, and more laughs and tears were shared. And I learned more about Scott, and who he was. And each new story made me love him more, and sure enough the stories were and are inspiring. And funny. So Scott, we're so sad that we will not get to know you further through more meals or birthdays or stake-outs-of-suspicious-strip-mall-stores, but we know your loved ones will always be a part of our lives, and we know they will always have another story to share to help us know you better. You're gone, but your memory and the people you touched will surely continue to inspire us. 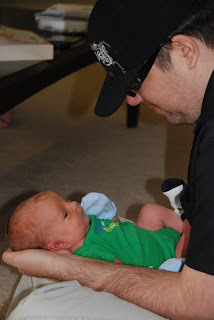 You may not get to be here to personally help me groom Jackson into Kingsley's future husband, but you inspired me and inspire me to be a better father to my son, so thank you. You are missed, but you lived a beautiful life of love and peace. You made the world a better place. In other words, your life was and is a success. We love you. RIP Scott. Though we never knew you, it is clear that you were indeed a special person. Our hearts go out to your family. Likewise we'd not had the pleasure of meeting Scott but he sounds a fantastic friend - by the sounds of your thoughts, his memory will always live on. Kingsley will appreciate all your stories when she is older. Wishing our love to all Scott's family and friends. Your kind words and endlessly kind and thoughtful gestures and support are part of what keeps us going. . .Thank you. See you soon.